Photo captions: (Top left) The Fat Chance Show Team won the Team Herdsman Award. (Bottom left) Abby Crawford is pictured with Charley Belcher. (Bottom middle) Tori Harrison from Winter Haven High School FFA shows her commercial heifer. (Right) Brianne Pueschell hugs her market steer Barclay. WELL, THE 2015 POLK COUNTY YOUTH FAIR in Bartow was a complete success! Every day was filled with exciting events. SUNDAY (Jan. 25) was the hog show, and with almost 300 exhibitors showing their market hogs, you can only imagine the arena! MONDAY (Jan. 26) afternoon was the first-ever goat-tying event, and the annual whip-popping contest was held that evening. Since it was the 20th anniversary of the whip-popping contest, past winners were asked to come back and show off their skills once again. 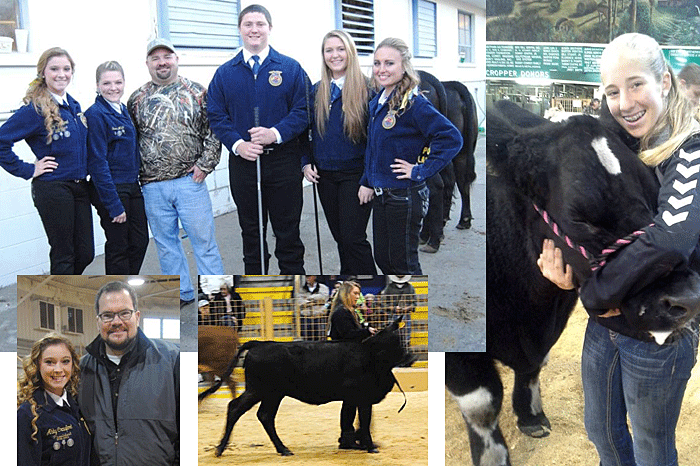 TUESDAY (Jan. 27) was a pretty busy day at the Polk County Youth Fair. Charley Belcher came again this year and kicked off the market hog sale by auctioning off the grand champion market hog, shown by Miss Kyndal Sowell. After the hog sale came to an end, the commercial heifer show followed. WEDNESDAY (Jan. 28) was the first-ever Top Ranch Hand contest, sponsored by Dr. LuJean Waters. We had 32 contestants, some of whom have grown up on ranches and some who had no idea what they were doing, but every contestant learned something new that day — and some even came back and taught their parents a thing or two! Wednesday was also the chili cookoff. I have to give kudos to the judges because just on the few chili recipes I tasted, it was tough to decide my favorite! The first goat show was in the afternoon and I, for one, loved it. I want a Nigerian dwarf goat now, so if any of you have one for sale, please email me! THURSDAY (Jan. 29) was the purebred show, market steer show, and the sew-off, which took place in the W.H. Stuart Center. Plus, there was a rabbit-judging contest. Every day you could go into the W.H. Stuart Center and pick a dessert that kids made to make a donation for the Polk County Youth Fair Scholarship. So, my mom and I bought something new to try daily and, let me tell you, I do believe we have some little Betty Crockers in Polk County! FRIDAY (Jan. 30) was the last day of the fair and the market steer sale ended the week. There were lots of tears shed in the Hayman Arena that night. Many of them were from high school seniors who, as they thanked their buyer for support, realized it was their last time ever showing in that arena. Many of us were first exposed to the Youth Fair as youngsters. We came to watch our older cousins participate in this time-honored tradition, and it seems as though our time to show our animals came and went, just like that. Before we knew it, it was time to pack up and leave, knowing that when the next Polk County Youth Fair comes around, we won’t be exhibitors any more. We’ll be the ones who help out the new kids and volunteer every day so we can still be a part of it. All in all, this was the best youth fair yet. We had kids who were showing for the first time and ones showing for the last time. We had guests who were complete strangers to agriculture when they arrived but leaving the fair knowing something about agriculture and able to spread the word. The hard work that we as exhibitors put into our projects this past year was all worth it. Congratulations to all the winners and exhibitors at the youth fair, and a special “Thank you” to all the buyers and sponsors who supported each and every one of us. ABOUT THE AUTHOR: Abby is the president of the Haines City High School FFA chapter as well as the voice behind 97 Country’s radio segment, “Ag Time with Abby,” which airs the first Friday of every month during the “Breakfast Club with Roger and Melissa.” Abby is also the 2014 Polk County Farm Bureau Youth Speech Contest Winner. For questions, FFA news, or FFA story ideas, email Abby at abbigailreis@gmail.com.